In recent years, the healthcare delivery system in Malaysia is confronted with unprecedented financial pressures. As a consequence, there has never been a greater focus on the need for value-based healthcare quality, outcomes and patient experience. Initiatives and research that demonstrate the potential of health innovations in achieving better patient outcomes, improving patients’ quality of life and reducing economic burden of disease are of utmost value. In line with this, the PhAMA Awards 2016 will recognize projects with demonstrable improvement in outcomes, or suggestions and recommendations that could be implemented to support the development of a value-based healthcare delivery system in Malaysia. To celebrate the efforts in innovation and research by individuals or groups with significant contributions to healthcare and/or standards of care in Malaysia. Submissions of projects that are completed, ongoing or in planning stage, from year 2014 onwards are welcomed. The project can be conducted individually or as a group effort. A regional/multi-country collaborative project is allowed; however, the principal investigator must be a Malaysian citizen and the research must be carried out in Malaysia and beneficial to Malaysians. Submissions of projects that are funded by healthcare or pharmaceutical companies are allowed. Past submissions from PhAMA Awards 2014 & 2015 are welcomed; however, past PhAMA-awarded submissions will not be accepted. All submissions will be thoroughly screened for compliance to theme and criteria. The decision of the panel of judges shall be final and non-appealable. 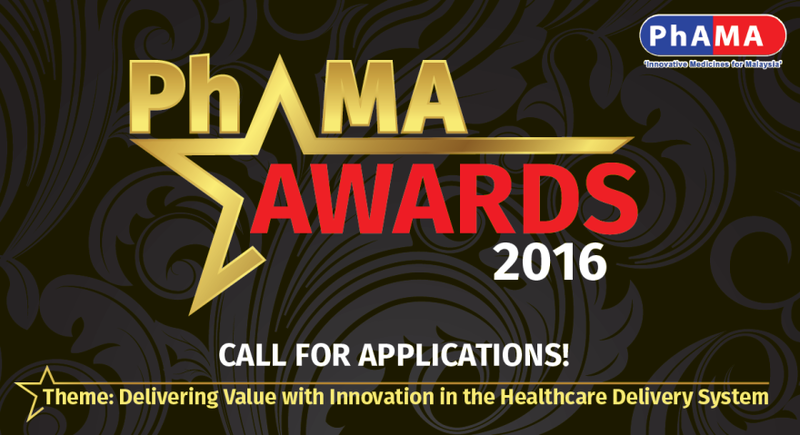 Award winners will be announced at the PhAMA Award 2016 ceremony. The Pharmaceutical Association of Malaysia (PhAMA) is an association comprising of innovative pharmaceutical companies in Malaysia. Our members are involved in research & development, marketing, distribution, sales, as well as warehousing of pharmaceutical products in Malaysia. The association serves to build relationships between pharmaceutical companies and other stakeholders of the healthcare sector, namely consumers, healthcare providers, hospital and clinic administrators, the media, regulators and the Government. Our ultimate aim is to ensure access to quality healthcare and healthcare products by all Malaysians. Registered in 1972, our members currently include 41 local and multinational companies. Our members’ activities are centred towards providing access to innovative & researchbased medicines for a better health and an improved quality of life for all Malaysians.